This Mini Grinder kit does it all! 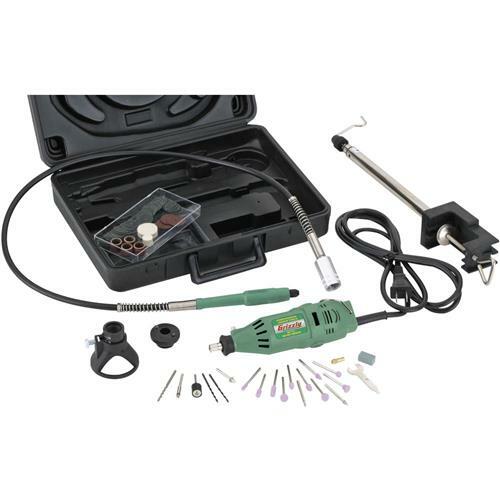 Not only do you get a 8,000-35,000 RPM variable-speed mini grinder, you also get a 42" long flexible tool shaft with a handpiece for power carving. Other features include a mini router base, interchangeable flashlight base, telescoping tool holder with clamping base, and a whole assortment of buffs, sanding discs and drums, grinding stones, mandrels, drill bits, wrench, and a spare collet—all in a convenient carrying case. Collet size is 1/8". This is a wonderfully portable tool for a wood worker or wood carver; maybe even stone carving, although haven't tried it yet. Very portable with a great traveling case. Usually, once unloaded, it becomes difficult to get package back inside the case. Not with this grinder - it has bee very comfortable and quick to unpack and start working. Gotta love the mobility of being able to set up on a picnic table or workbench. Thanks Grizzly, once again and as always, great equipment.